"Make a webpage you'd want to look at", we tell our Web Skills students, many of whom have trouble choosing a topic for a practice web page. Fair enough. I'll look at any page about tubas. I hope some day to stop torturing mine and learn to really play it. 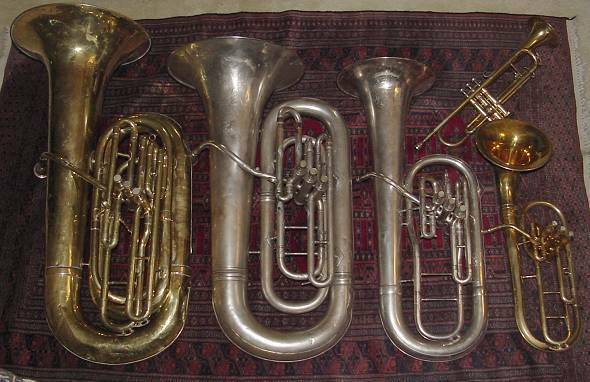 This view of five brass instruments from my collection shows the relative sizes of five instruments: Tuba in BBb, tuba in Eb, euphonium or baritone in Bb, alto horn in Eb, and trumpet in Bb. The differences are particularly easy to see since my preference for front-facing valves has resulted in my acquiring four instruments with very similar designs. In all four, the mouthpipe leads directly into the first valve, without a first loop used for tuning as on many instruments with top-facing valves.